It’s Friday, which means it’s time for a good, old-fashioned Search trends round up. Read on to see what the world wanted to know this week. 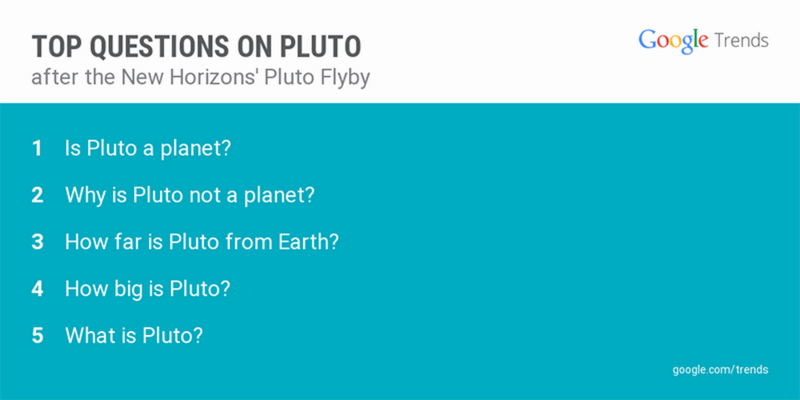 It may have lost its planetary title, but Pluto officially became the most distant solid object to be visited by spacecraft as NASA’s New Horizons successfully completed its “flyby” this week. The mission to explore the dwarf giant took a mere nine years and 3 billion miles of space travel and has already returned some truly incredible high-resolution images of Pluto and its moons, including the most epic vacation Instagram of all time. Searches for news about the mission topped 5 million, plus another 100,000+ searches for photos. In other historic and out of this world news, Louis Tomlinson is the first member of One Direction to announce he’s going to be a dad. While this was likely upsetting news for many 1D fans, it didn’t stop the searches--Louis racked up more than 500,000 of them this week. And, we’ve all got Jimmy Fallon to thank for this week’s most disgusting search trend, a truly horrifying finger injury called ring avulsion. Fallon, who was sporting a bandaged hand from behind "The Tonight Show" desk, explained that he had surgery following a freak accident involving a kitchen counter and his wedding ring. Searchers took to Google to find out more and with search interest in images of ring avulsion up 50x over the last week, we’re willing to bet at least a few of them probably wish they hadn’t. 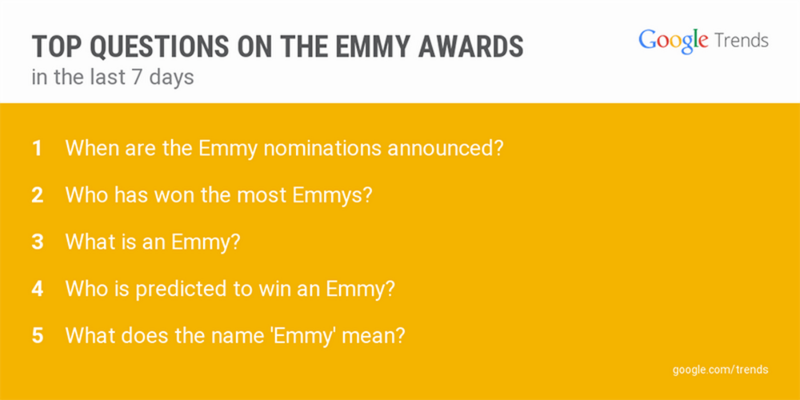 Nominations for the 2015 Emmy Awards were announced this week, inspiring more than 200,000 searches. Gone but definitely not forgotten "Parks and Recreation" was the most searched Emmy nominee for a comedy series, though Amy Schumer (whose new movie "Trainwreck" opens today) edged out Amy Poehler as the most searched lead actress in a comedy. In a potential preview of the 2016 Emmy Awards, Rachel McAdams, who co-stars in the new season of HBO’s "True Detective," was searched more than 50,000 times this week. It was a good week all around, and to play us out, we recommend Wilco’s new album, Star Wars. The surprise, free-to-download release this week resulted in more than 50,000 searches--and a lot of excited Tweedy fans.